Small may not be so beautiful for airline passengers; that is, if current concepts in economy seat design get a foothold in the airline industry. The airline seat of the future may not be a seat at all. In fact, if Italian seat designer Aviointerior has its way, it may be more of a, well, perch. While it may not be the first time such concepts have been proposed, perhaps the scary part is that this concept of stand-up airline seating keeps coming back to live another day. The latest version has passengers propped up on a bicyclelike seat, with surrounding seats blocking the passenger into a clean and cozy fit. The model is the Skyrider 3.0, an improvement, they say, on the Skyrider 2.0 that debuted last year at the Aircraft Interiors Expo in Germany. According to CNN reports, the design company stresses that this concept is not about creating a "cattle class," perhaps a notch below basic economy, and cramming in as many passengers in as possible. "The message is, we do not want to put thousands of people in the cabin, we want to offer a multi-class configuration, which is nowadays impossible if you want to reach the maximum load of passengers," Gaetano Perugini, engineering adviser at Aviointeriors, told CNN. However, the Skyrider seat offers much less space than the average economy seat — just 23 inches — so airlines could, indeed, create a cattle car economy class. Current comparable measures in airline economy class seats run from 29 to 32 inches. "So that means that in the same cabin, you will have standard economy, premium economy or business class and ultra-basic economy — which is an innovation for the airline and the passenger," Perugini said. "This is the true reason for the Skyrider." The design was first proposed back in 2010, but had some structural issues that prevented it from taking off. Indeed, Ryanair proposed a type of vertical seat in 2010 that never made it off the drawing room floor, although some 42% of those polled said they would book the seat if it were at half-rate. The design would have allowed the airline to cram an extra 40 or 50 passengers into the cabin. Similarly, Airbus came out with a patent for a saddle of sorts in 2014, which became the target of jokes but never made it into the cabins. The current model, as with the others, does not bode well for every body type, perhaps any body type. "If you read the specification of the A380 or the A320 — or the A321 or the 737, you read that it’s not allowed to be installed at a pitch of less than 28 inches," the engineer explained in the report. The seats look similar to a bicycle seat but with back support. But like other designs before it, this "ultra-basic economy" is getting a lot of stares but not picking up a lot of interest. Even more recently, something called "the Move" was introduced by London design firm, LAYER. The seat looked more like lawn furniture you might find under an awning than a prototype of what the airline seat of the future should be. However, this seat debut had much more to it than form. It actually behaves like a robot of sorts with sophisticated systems of technology woven into seemingly simple fabric. Designed for Airbus use on short- and medium-haul flights, the seat design is enabled with smart sensors that allow passengers to control their seat settings via an app on their phone. Flyers will be able to work with seat temperatures and find the sweet spot for back support as sensors calculate their height and girth. The Move, via a downloaded app, will "communicate" with occupants, telling them when to hydrate and when to stretch. The seat will even offer a massage setting. "Throughout the journey, the Move seat automatically adjusts based on passenger weight, size and movement to maintain optimal ergonomic comfort," said LAYER founder Benjamin Hubert in a press release. "This is made possible by passing current through the conductive yarn to vary the seat tension." The Move was 18 months in the making, thanks to a partnership between Airbus and LAYER. The prototype presents a lightweight perforated composite frame with a knitted, one-piece sling seat suspended over it. 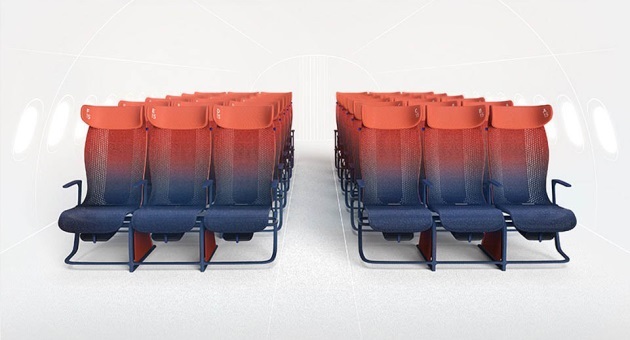 The digitally knitted seat cover weaves into a smart textile with integrated conductive yarns of various densities that offer different levels of support. The seats do not recline, rather, they "mold." 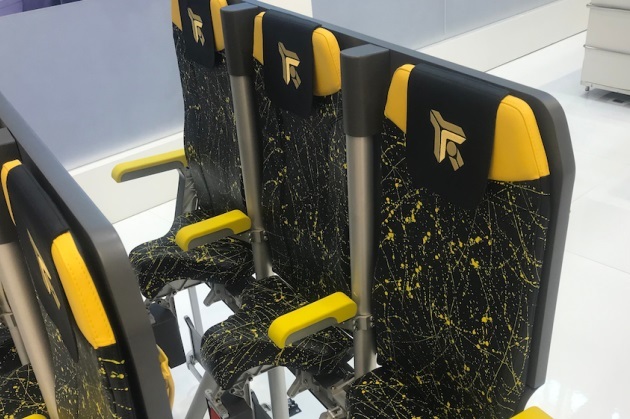 Passengers can choose from four different "seat modes," which wrap and adjust to the passenger’s shape without infringing on the personal space of other flyers. The Move app can respond to positioning needs, such what is needed for dining and what is needed for sleep. The seat can tell if the passenger leaves the seat, or has left something behind in the seat back pocket. The tray table, stored vertically, is height-adjustable and can be fully extended or folded in half for more seat space. "All too often, new concepts for flying are focused on innovation in business class," Hubert said. "We were excited to take on this project with Airbus to find ways to improve and add value to the economy class experience — for both the passenger and the airline." While we do not know whether economy cabins of the future will look more like buses with poles and dangling straps to grab, a compendium of customized integrated technology to dazzle customers but mostly confuse, or a surprisingly comfortable and relaxing appointment that will make flying all the more pleasant … the jury is out — way out — at present.